Hari Bahadur Kami of Jajarkot (right) was taking his wife, Gauri, and six-year-old daughter, Kalika, to a health post in the village of Panchkatiya when night fell during a three-hour climb up the mountain. The family took shelter from the rain in a roadside shed. Kalika was retching, and her frail body became weaker. The little girl died at midnight. The next morning, Gauri was also dead. 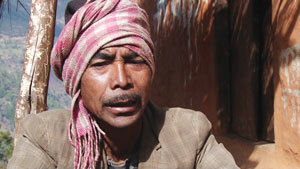 Four days later, her 14-year-old son, Dhan Bahadur, also died on the way to the health post. It was July 2009, and a cholera epidemic was raging in this mid-western hill district. Kalika, Gauri and Dhan became just statistics: among the 400 who were killed in one of the deadliest outbreaks of cholera in Nepal’s recent history. Five years after the epidemic that was caused by drinking water contaminated with human faeces, Jajarkot has taken measures to prevent a similar outbreak. Last month, the district was the latest to be declared open defecation free. Hari Bahadur remembers the dusty trail leading to his village of Dhime (pictured) would be littered with human waste. Today, this trail and others in the district are clean. Water sources are covered, and there are newly-constructed latrines outside most homes. In 2009, only four out of 10 households in Jajarkot had toilets. In the past four years, 20,000 new latrines have been built. The loss of life in 2009 was so shocking that it galvanised everyone to act, and more importantly, to coordinate activities. A district sanitation plan was introduced in 2011 and Jajarkot became the first district in Bheri Zone to be declared open defecation free, and the 20th out of 75 distrcits. The National Sanitation and Hygiene Master Plan was launched by the President in 2011, which aims at universal sanitation coverage in all districts by 2017. “What worked for Jajarkot was that the DDCs and VDCs took the initiative, the external agencies just facilitated the process,” said Madan Raj Bhatta of Water Resources Management Program, Helvetas. The village mother’s groups, political parties, students, all played a role, recalls Ghaman Man Singh of Rokaya Gaun, where the first cholera casualty was detected in 2009. Sanitation cards were distributed to villagers having home latrines so they could get other incentives from the district. Students having toilets were given bonus points in their report cards. Women’s groups and volunteers played an important role in awareness raising. Moti Ram KC of Jagatipur recalls having to dig the toilet pit himself when a homeowner couldn’t be convinced to build a latrine. “It wasn’t that he couldn’t afford it, he just didn’t want to build one. So we called up the police and started constructing one by ourselves,” KC recalls. Now, that Jajarkot has been declared open defecation free, there are challenges of ensuring adequate and safe water supply in the outlying villages. At Jagatipur one recent morning, health post staff were gathered to discuss what to do because the tap had gone dry. Maybe building latrines is only the first step. Why invest in an MBA program only to market yourself shoddily? Its not the same old song-and-dance anymore in Nepals film industry.